Do you want to learn how to travel the world for as long as you desire, on your terms while spending less money? Whether you're a travel newbie dying to figure out how to explore the world, an occasional traveler longing to make your holiday everyday, or an experienced globetrotter seeking unique ways to keep traveling full time, you're in the right place. 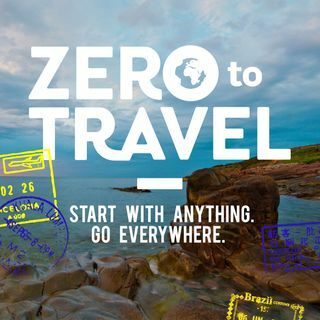 Travel expert Jason Moore from ZeroToTravel.com chats with adventurous people living life on the road so you can discover new ways ... Maggiori informazioni to travel endlessly. Jason and his guests share insanely actionable advice and key resources, getting down and dirty on topics like; starting and running an online business from anywhere, travel and work opportunities, gutsy budget travel strategies, surprising ways to earn free travel, the digital nomad life, unconventional travel based lifestyles, fun travel jobs, how to plan epic adventures, backpacking, 4 hour work week inspired topics, and everything in between. Jason has wandered the planet for 15+ years working as a tour manager in events/music, an adventure travel tour guide, a trash sweeper, and now as a location independent entrepreneur running businesses on the fly. He is obsessed with doing whatever he can to help you explore our crazy planet, no matter what your current situation or experience. Let's do this! Subscribe now and welcome.